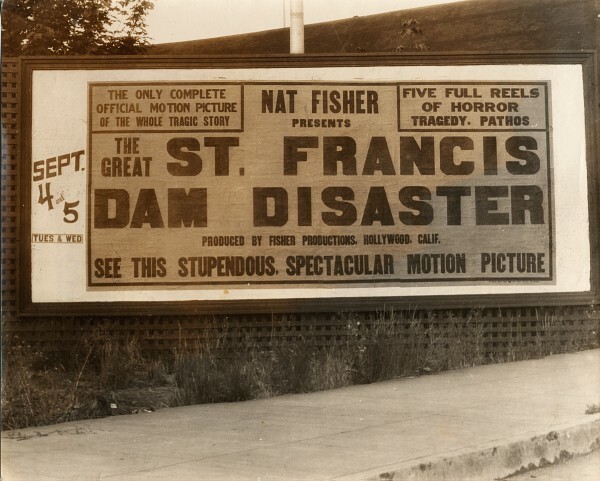 Billboard for an obscure 5-reel film about the St. Francis Dam Disaster by Nat Fisher, released in 1928. The only complete official motion picture of the whole tragic story. Five full reels of horror, tragedy, pathos. Produced by Fisher Productions, Hollywood, Calif.
See this stupendous, spectacular motion picture.